It’s also the time of year when I have seasonal products available! These are products I may not have at other times of the year, or they’re very limited in supply, so get them while you can! 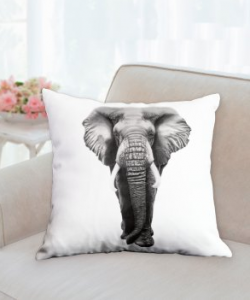 One of my all-time favorite seasonal items are the decorative pillows! 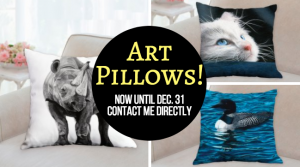 You can get almost any of my artwork on one of these square pillows. They can be double-sided, or have a single color (usually black or white) on the back side. 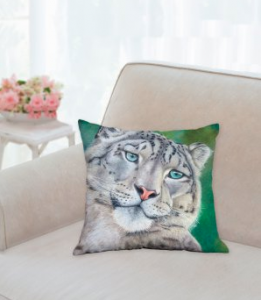 I’ve even had people order pillows that have one piece of artwork on one side, and another on the back! Contact me to make your order. These make great gifts! Contact me directly to order yours today! 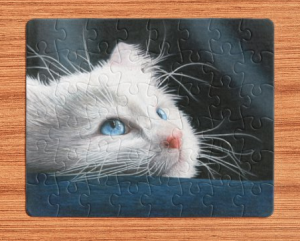 48-piece puzzle featuring my Blue-Eyed Kitten colored pencil drawing. You can also get my artwork as a 48-piece puzzle! Most of my artwork is available as these puzzles, only available until the end of 2017! Each puzzle is $32. Contact me directly to order yours! 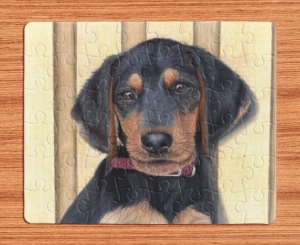 48-piece puzzle featuring my Beagle/Dachshund Puppy drawing. 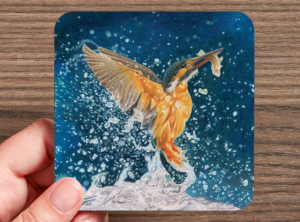 Coaster, featuring my Kingfisher colored pencil drawing. You can also get coasters of my artwork, from now until the end of 2017. They come in a set of 4 for $32. Again, most of my artwork is available in this form! Contact me directly to order yours. 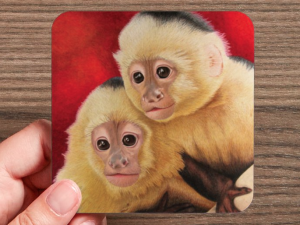 Coaster, featuring my Two Capuchin Monkeys colored pencil drawing. 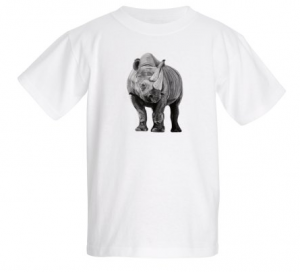 Kid’s T-Shirt featuring my Black Rhino drawing. Each shirt is $18. Contact me to order yours.